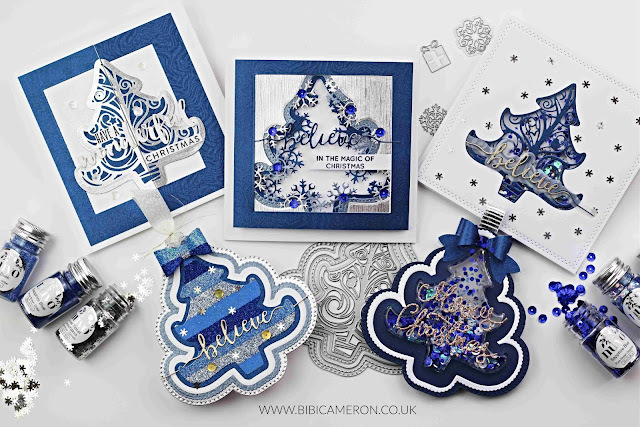 Hello there, today I'm sharing ideas and the card samples I made for the latest Tonic Studios release at Hochanda Tv today ! 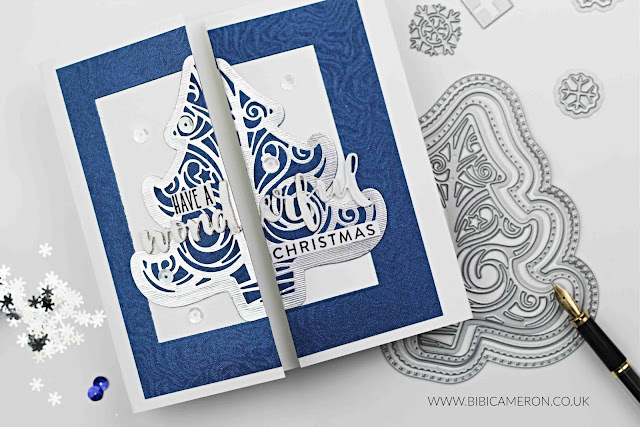 Watch the shows on the Hochanda Tv schedule ( Monda, September 10 - 2018) or click here to be redirected to the live demos with Paula Pascual. 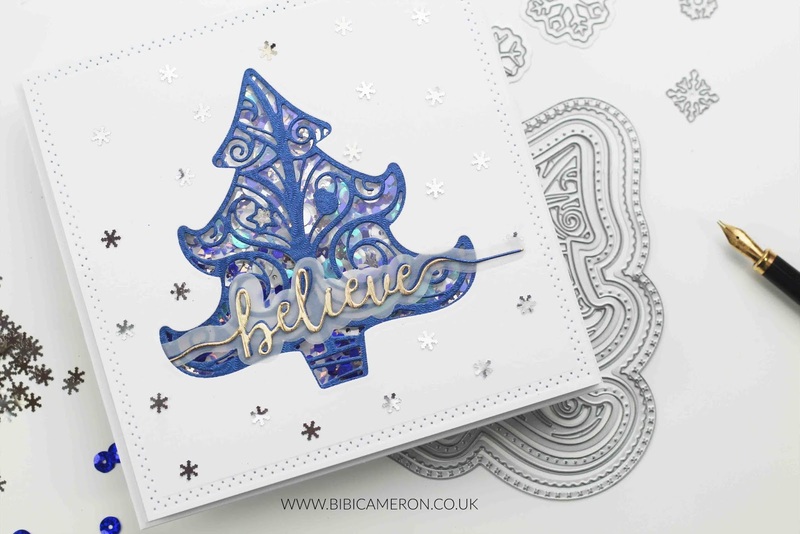 In this release, you will find a new Nuvo Pure Sheen Glitter Confetti and Sequins collection, a layered Christmas tree themed die set called: Winter Spruce ( there are 23 dies in this set) and Winter Spruce shaker refill (blisters) that coordinates with the tree shape. 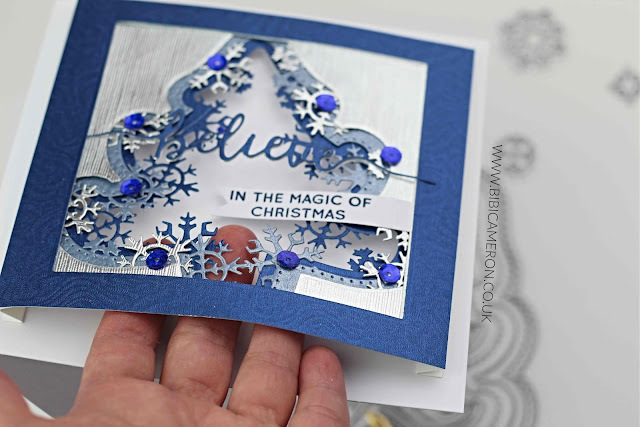 I used only the blue shades of glitter, confetti and sequins to make easy Christmas cards. Can you see in the picture below what I did? It is hard to explain with words but I create a large piece of cardstock with a square window in the centre and I layered behind pieces of different cardstock colours that I previously die cut. I folded the sides as shown in the picture below and I glued only the side flaps down. 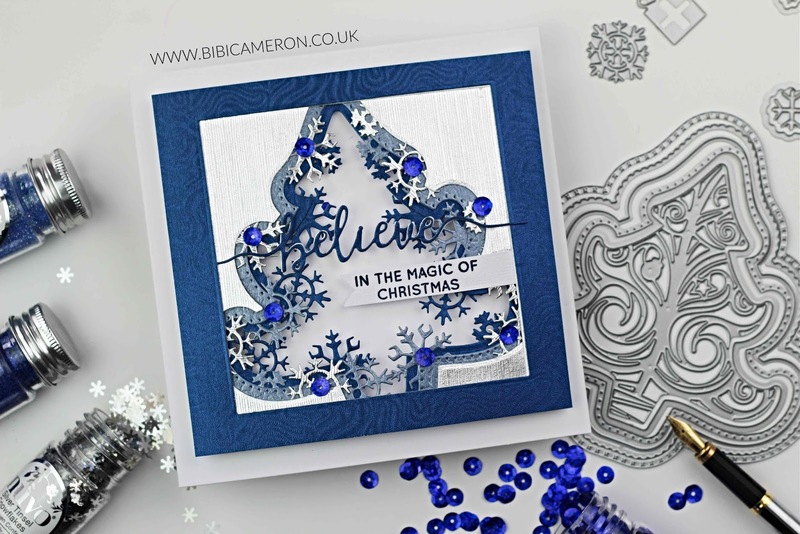 Then I glued snowflakes I die cut using other dies in the set to fill in the centre of that window, I added the sentiments and sequins. 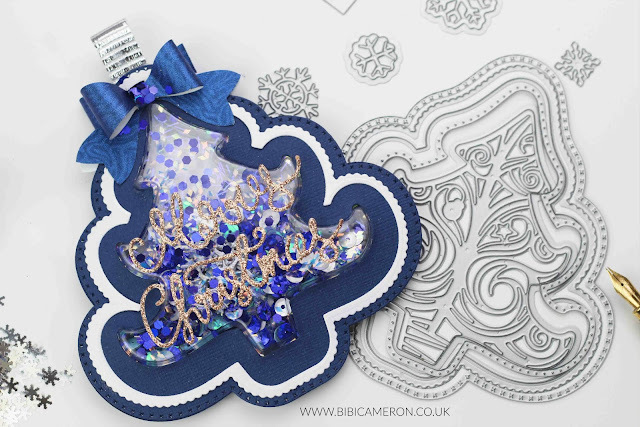 What about making a Christmas tree shaped card or tag? I used double sided tape to stick the different shades of blue and silver glitter on a piece of paper and then I die cut the tree. I removed the backing of the double-sided tape on the areas I wanted to add the same colour of glitter, then I applied glitter and I repeat the same process until the paper was fully cover by different glitter colours. You can also make an ornament for the Xmas tree and fill it with confetti and sequins. 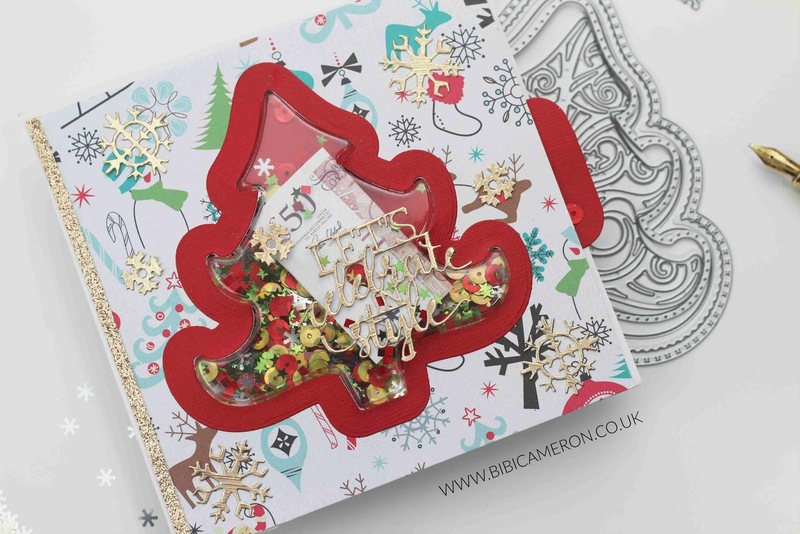 You can also put jewellery inside, money, chocolates or any other small treat or gift. A while ago I had the idea to add foil behind the shaker so it will be easy to get the contents inside the shaker by simply tearing the foil paper. Use acetate to create a shaker card and use the intricate dies to create a nice decorative element over the shaker. Although the samples below are not main projects for this release and they aren't blue, those are other extra ideas I want to share with you. The card below was a draft but you can see in the flesh an idea to use the shaker in a different way.. as I mention below you can put any small treat or gift inside the shaker. In this draft, I also added a pull-up tab behind the shaker to be able to get the contents inside without tearing the card apart. 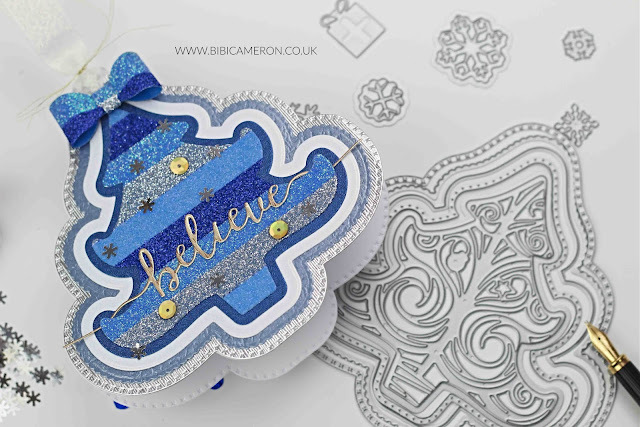 Buy Tonic Studios supplies here, at Hochanda TV or your favourite craft shop. Wow! These are all so fun and BEAUTIFUL! Love! 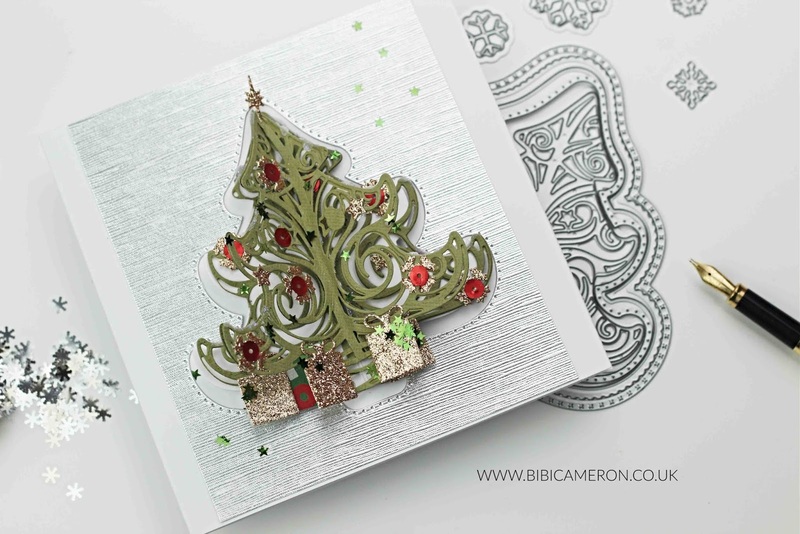 Now these are beautiful, I love the delicate 3 D trees you made. Beautiful, thanks for inspiring me.